Rental Car Companies Only Have To Pay $10,000.00 For Injuries! The Florida Supreme Court on April 21, 2011 decided Vargas v Enterprise Leasing Company, ___Fla. Sup.Ct.___, SC 08-2269, which decision confirmed that a rental car company only has to have a limited $10,000 liability policy to pay for injuries caused by the renter and the RENTAL CAR COMPANY AS A VEHICLE OWNER. What does this mean to you? This means your injury attorney or agent will want to advise you to buy uninsured motorist coverage in the amount of your bodily injury liability coverage. Selecting stacking of your uninsured motorist coverage is better for you because it allows you to increase the amount of your uninsured motorist coverage by the number of autos in the household. So, if you have four autos in your household, each with a $10,000.00 policy of uninsured motorist coverage, then multiply the $10,000.00 by 4 and you now have $40,000.00 available to protect YOU AND YOUR FAMILY. Why is it important to protect yourself and your family by buying UNINSURED MOTORIST COVERAGE in view of the Vargas case? Many renters are from foreign countries and are unfamiliar with our Florida roads and tolls. 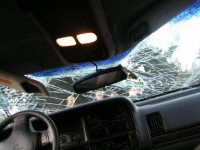 These drivers can cause injuries and then fly back to their homeland, leaving the Florida resident injured. The uninsured motorist coverage protects the injured Floridian by adding the uninsured motorist coverage on top of the $10,000 liability policy. If your daughter leaves school and walks across the street and is struck by a car that leaves the scene, your uninsured motorist coverage pays for your daughter's injuries. Your husband goes with his college friend to Alabama to participate in a sporting event. The friend accidentally runs over your husband and breaks his leg. The friend has only a $10,000 policy of liability insurance. If you have uninsured motorist coverage that stacks on top of the liability coverage, then your husband can then recover the full amount of your uninsured motorist policy. One more example is you are at your office and everyone is going to go to lunch to celebrate a coworker's birthday. You're in the vehicle with your coworkers and you are rear-ended by a drunk who leaves the scene of the accident and drives away. Yes, you are right - your uninsured motorist coverage would pay for your injuries! The Florida Supreme Court decided Vargas v Enterprise Leasing Co., __Fla.Sup.Ct.___, SC 08-2269 from a case coming out of Palm Beach County on appeal from the Fourth District Court of Appeals. It held that the Federal Graves Amendment, which requires all the rental car companies to carry only $10,000 in liability insurance, is valid and enforceable in Florida. Our Florida Statute 324.021(9)(b)(2) does not preempt or overcome the Federal Graves Amendment.